I would love to find a rug to put in between them to cover up that crack and pull it all together~if you see any amazing deals on outdoor rugs, will you alert me? 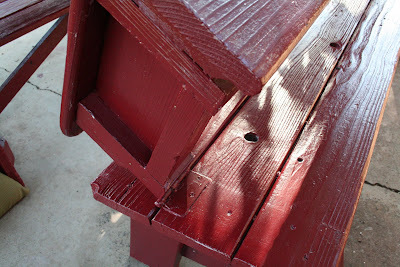 Oh, and P.S., the paint color on the oops can is Valspar Spanish Tile. 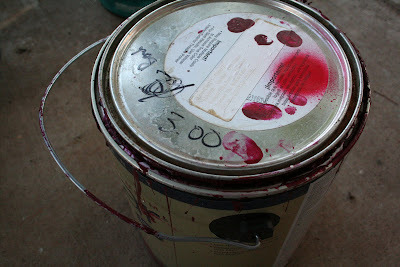 I don't know why it was an oops can, but it is a delicious, rich shade of red. Looks just charming! Love the red! WOW!! it looks so good. Wish I had riends like that. It looks great! I saw those benches at a farmer's market/craft in Provo and wished upon a star that I didn't live in a 2 bedroom apartment. :) They will be wonderful for your family! this looks super fabulous! i love red. i've been looking for outdoor furniture & decor on sale but no such luck yet. your makeover is beautiful! i host a goodwill party every wednesday, stop by & link up! Your patio looks great! That red is a great color! so cute! I love those benches, how convenient! Fun! How cool are those benches!! 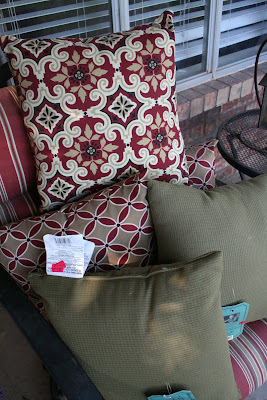 I have a weakness for pillows especially "sale" pillows Love the ones you picked!! 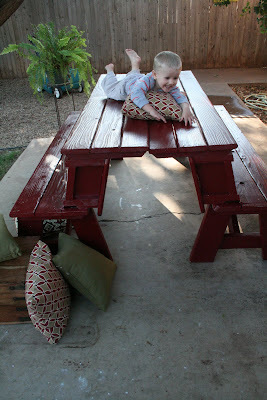 I love the picnic table! Beautiful! I'm only slightly jelous of the great weather in your pictures. We have been FREEZING this week. It attempted to snow (it actually did for a little bit but melted as it hit the ground)on Monday and then it's just been cold and rainy since. I had to bust out the winter coats already! 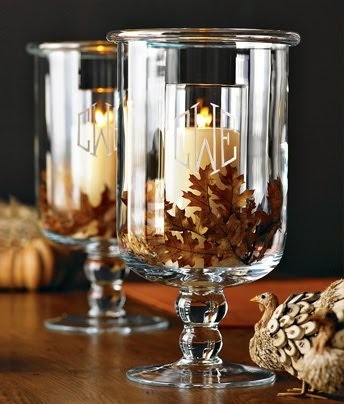 I would love some nice fall weather right now!!! That looks great! And what cool chairs ~ turning into a table; very creative! That color really suits them, too. Melissa those benches are TOO COOL! I LOVE them!! the whole patio looks wonderful! 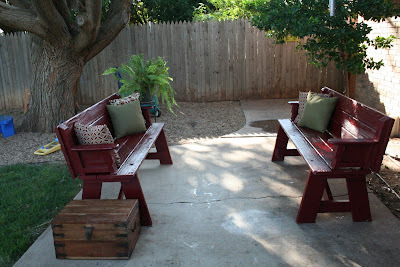 I love love love those benches and its so cool that they turn into a table.. your patio redo looks nice. ur patio looks great! you now ready for a nice outdoor party! Looks great! Love those benches! Great color! And I love those bench-to-table things... used to want one myself once upon a time but went a different direction. You might try outdoorrugsonly.com for a well-priced rug--I've heard they're a good source--or even Pier 1 if you have a store near you. What a wonderful look you have! Those benches are perfect...love the red too. The flowers and the pillows, everything goes perfect together! I would even use that red for more things maybe a small planter, or plant stand, watering can....you did a great job putting all the colors together. I love it! Looks great! Lovely finds and a great eye = perfection! How cute!! Have you thought about filling in the crack and "painting" a rug on the concrete? I LOVE that the benches become a table!! Great facelift, very charming. And you so scored with those benches/table! I was at Target (in the Dallas, Texas area) and their outdoor rugs were on sale for $15 regular $49. They are in the same section as the indoor rugs. Love it! 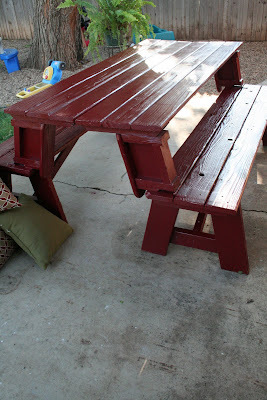 Such a fabulous idea and what darling benches. The red is perfect and your cushion finds are awesome. Good job lady! 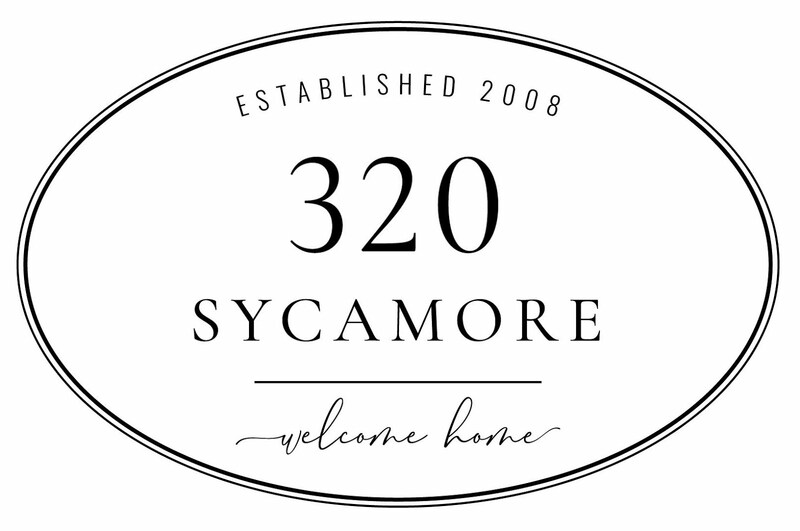 Check out Home Decorators Outlet for an outdoor rug. I got a big one last year for 80% off...I search under rug finder in the price range I might be willing to spend. 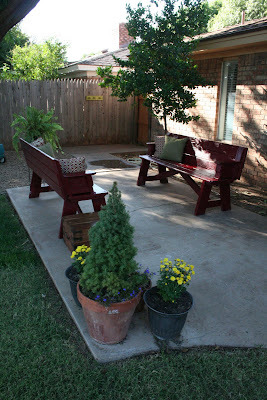 Or, get some cement paint and sealer and paint the patio. 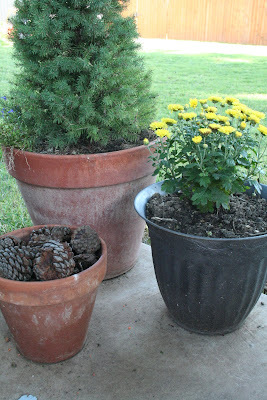 I have plans to paint my patio if it would ever stop raining here in GA! Ballard Design is having a sale on their a few outdoor rugs, they're a bit pricey even so, but make a statement. You could always paint the cement for a forever rug! AWESOME!!! Where can I get those benches/table??? Love it, looks so GREAT! Hello Melissa - love your patio! Those benches are fabulous and make such a great impact. 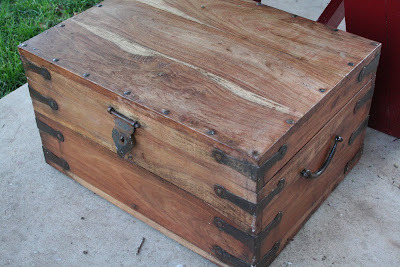 And I think that wooden box is so cool! Nice job.